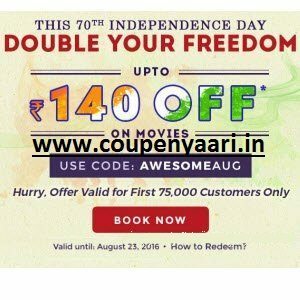 BookMyShow Movies 50% off on Booking 2 Tickets + upto 50% Cashback – BookMYShow Celebrate 70th Independence day with BookMyShow 50% discount offer, also get upto 50% cashback with wallet payment. Checkout below post to know how to avail this offer. Valid for select users only. The offer entitles you to a 50% discount or INR 140, whichever is lesser. The offer is valid until 23rd August, 2016. This offer is for the first 75,000 customers only. The offer is valid only on those email IDs on which this communication has been sent. Kindly use the same email ID while redeeming the offer. BookMyShow additional discount and cashback offer using wallets. PayZapp: 50% cashback up to a maximum Rs. 100 on App (Extra Rs. 50 cashback for 1st time users) on Fridays, Saturdays & Sundays on only App Terms and Conditions. BookMyShow wallet on Monday to Thursday: 50% cashback upto Rs. 60 , for any show between the same Monday and Thursday, and get 50% cash-back Terms and Conditions. Freecharge Wallet: 10% cashback upto Rs. 50. Terms and Conditions. Pockets By ICICI wallet: 20% Cashback upto Rs. 100. (Valid for 2 Transaction) Terms and Conditions. IDea Money: 5% cashback upto Rs. 100 Terms and Conditions. SBI Buddy: 15% Cashback upto Rs. 50 Terms and Conditions. How to BookMyShow Movies 50% off on Booking 2 Tickets + upto 50% Cashback? Proceed > Enter email id and mobile number.